Tired of chopping on cheap plastic cutting boards? Looking for a tough, elegant, and safe solution to prep your food on? Here at ENTRUST GOURMET, we have just what you need! Unlike other brands, our cutting boards are extra durable, functional, and stylish. We selected bamboo because it is much harder and less porous than other wood materials. This makes it more difficult to absorb moisture that carries bacteria and germs, making sure that you and your family can have a clean and healthy meal! Our cutting board also comes with a juice groove to catch liquids keeping your countertop much cleaner! We have a 100% SATISFACTION REPLACEMENT WARRANTY so you can purchase this item risk-free. So What are you waiting for? Invest in your kitchen products. Click on the ‘add to cart’ button while supplies last! CARE INSTRUCTIONS: We take great pride in the quality of our products, and with proper care your Entrust Gourmet Cutting board should provide a lifetime of enjoyment and use. Our bamboo is treated with a light mineral oil application before it leaves our factory, so it arrives ready for you to use! 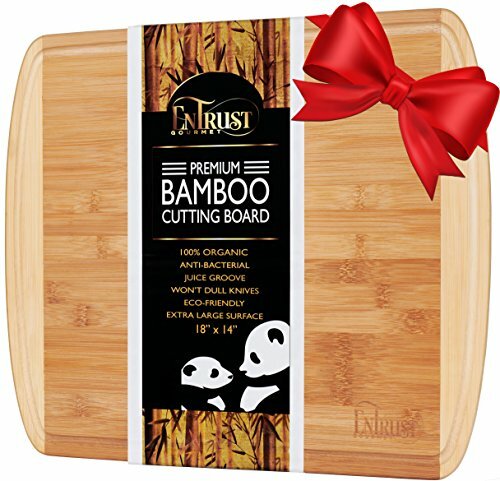 Some tips for proper care to preserve your bamboo board: Hand wash with gentle dish soap and warm water. Avoid soaking your board, and NEVER use the dishwasher! If you do not cook often you may wish to add a food safe mineral oil. -EXTRA-LARGE CHOPPING SURFACE: 18" x 14"- Use both sides in your kitchen. Flip your board over for the perfect cheese board or serving platter. -MESS-PROOF: Deep drip groove holds 2 oz of liquid, keeping liquids on the board instead of all over your kitchen counters! WHY BAMBOO? Naturally ORGANIC: ANTI-MICROBIAL and ANTI-BACTERIAL- Bamboo is harder and less porous than other woods thus absorbing less moisture that carries germs, keeping your family healthy and safe! ENVIRONMENTALLY FRIENDLY: Using bamboo instead of hard wood helps decrease deforestation. On average, hardwoods that are commonly used for cutting boards, take 30-60 years for a growth cycle. After they are cut down, replanting is a necessary step to begin the growth cycle again. Moso bamboo can be harvested approximately every 5 years and does not require replanting. We care about our planet. If you have any questions about this product by EnTrust Gourmet, contact us by completing and submitting the form below. If you are looking for a specif part number, please include it with your message.